Adobe continues to push the boundaries of how their design software can provide access and nurture the design abilities for the youngest learners. I still remember struggling in 9th grade to master a rather primitive version for Photoshop (shout out to version 4.0!). Today, I watch in amazement as children as young as kindergarten use Adobe Spark to creative powerful visual designs to share their classroom learning. For those on Chromebooks, Macs, or Windows devices you NOW have the ability to select multiple elements simultainiously to adjust your layout and design. This is a major feature update to address one of the most critical areas of design — productivity. As a designer, if your design looks incredible but takes you twice as long, you need to revamp your workflow and efficiency strategies. Same goes for the classroom where “spare hours” are few and far between. I hope to see this update reach iOS very soon! Another exciting update for ALL PLATFORMS is the ability to now adjust the kerning of words, which is design nerd jargon for the space between letters! As a designer turned educator, I am constantly looking at how design and visual communication can help our students visualize and better understand their learning in all areas of their education. A snapshot of one of the Common Core standards below shows that design tools can help our students understand meaning of words and text, and especially tone! While the right image isn’t bad design, the text on the left demonstrates how line spaces can convey a specific message and strengthen the meaning behind the design. Paragraph text also benefits from the letter and line spacing to increase readability of content. Many times students try to cram text into their designs with the purpose that others should engage with it, yet the small text and cramped spacing makes it difficult to enjoy reading the content. 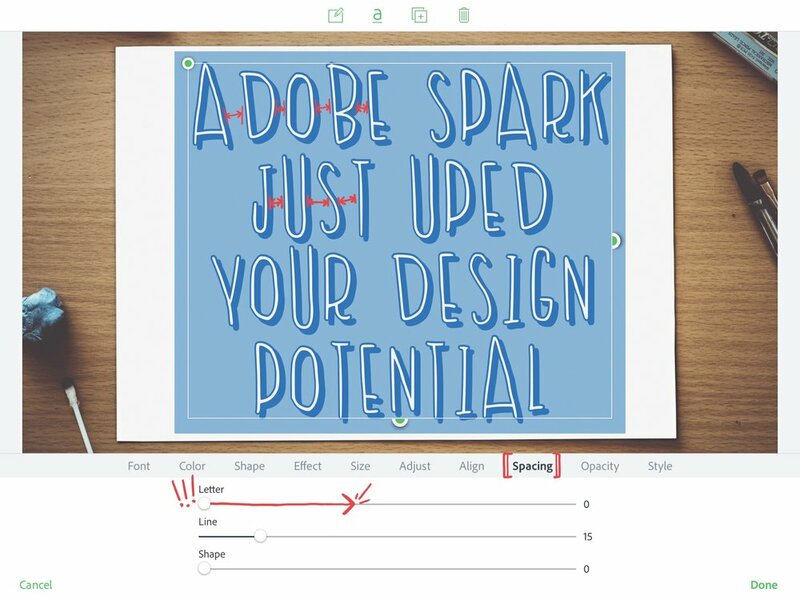 In short, the update will provide more use cases for Adobe Spark in your classroom, beyond simply creating beautifully striking visual content. It looks like the app is evolving from a minimalist text based product to something that could potentially support projects involving digital publishing of large quantities of written content. How will you incorporate these new features into classroom learning? Share your ideas and experiments below!